Wet Okole is the leading manufacturer of waterproof, climate control neoprene seat covers. These custom seat covers are backed with authentic quality-blended CR neoprene with nylon bonded to each side for maximum strength. Wet Okole seat covers protect your seats, fit snugly, and maintain the optimal temperature of your vehicle in all weather conditions. Neoprene seat covers are ideal for people with an active lifestyle. They will protect your seats from stains, pets, dirt, and sweat. All Wet Okole custom seat covers come with 1/2” of foam on the seat and seat back for extra padding, comfort, and seat protection. The neoprene is laminated with nylon on both sides, making it twice as strong. Thus, no rubber touches your seats which is especially important with leather or vinyl upholstery. In addition, every seat covers’ front and sides are impact air bag compatible and have been tested at an airbag lab for compliance. 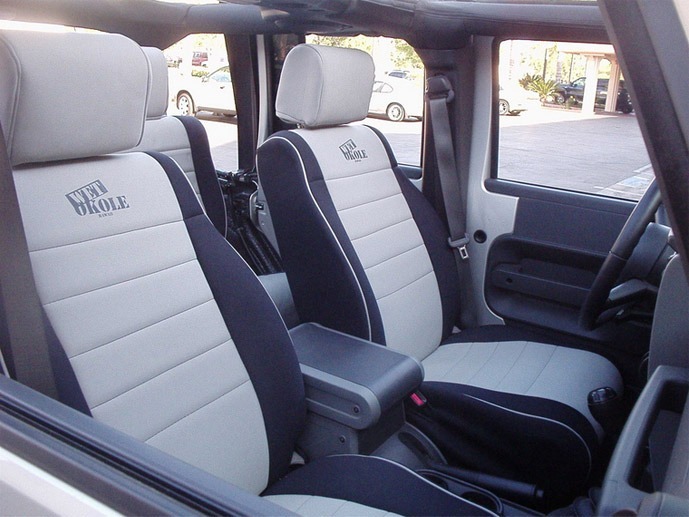 Wet Okole’s exceptionally comfortable and protective seat covers are available in a wide range of colors and designs to match most vehicle interiors. As an authorized dealer, C-Thru Window Tinting offers color and design combinations to fit over 1,500 makes and models of cars, vans, trucks and SUVs. They are easy to install and use high quality quick connect fasteners and velcro. Furthermore, the neoprene seat covers are 100% waterproof and tailored to fit the seats on each vehicle make and model. You will not see any wrinkling, looseness, or bunching. They will accommodate to the specific features of your seats including head rests, arm rests, switches for power adjustment and lumbar support, and seat-mounted air bags. As an authorized dealer, you can purchase Wet Okole seat covers directly from C-Thru Window Tinting. Although it is relatively easy, we can also install your seat covers for you. If you are interested in purchasing Wet Okole seat covers or have questions about which covers are the best fit for your vehicle, please do not hesitate to contact us at (808) 326-5488 or fill out our submission form.